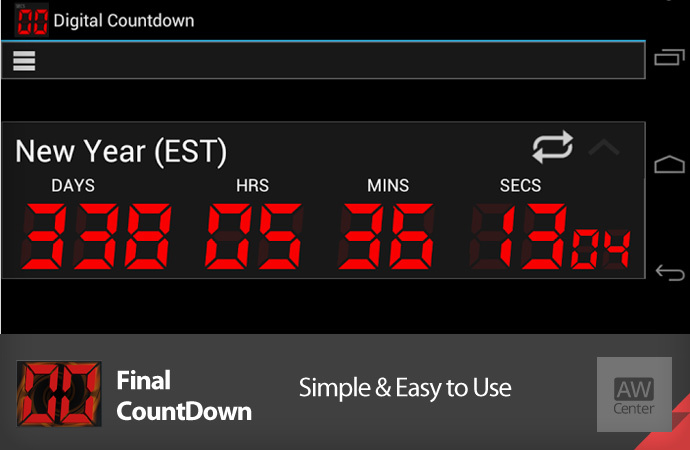 Overview: The top-rated Countdown timer calendar app on Google Play - Final Countdown. Featured in the latest Samsung S5 - Best Buy commercial. ✔ Milliseconds - We have that too! Did you get here by clicking a link such as "_http://fncd.net/v?id=wTDV10h"? install the app then click the link to have that same exact LIVE countdown. You can also view the live countdown on your home screen by adding a widget. Go to [You must be registered and logged in to see this link.] to add the latest live calendar we are sharing. Our team loves feedback. If you enjoy using the Final Countdown - Please consider rating 5 stars. If you think the app deserves less, please tell us.